Have you ever received an email from someone that says “Your welcome”? Did you cringe? Did you absentmindedly start stapling your finger while trying to deal with the rage boiling up inside you? No? Then there’s a good chance you’re making this kind of mistake, too – which means you’re probably causing that kind of anger in other people. 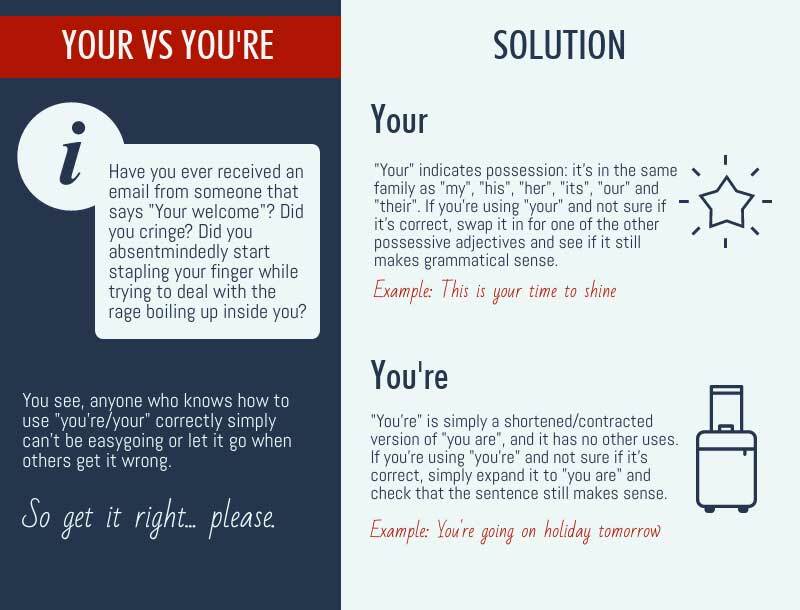 You see, anyone who knows how to use “you’re/your” correctly simply can’t be easygoing or let it go when others get it wrong: it’ll drive them up the wall and make them think less of you from now on. So get it right… please. “You’re” is simply a shortened/contracted version of “you are”, and it has no other uses. If you’re using “you’re” and not sure if it’s correct, simply expand it to “you are” and check that the sentence still makes sense. “You’re going on holiday tomorrow!” = “You are going on holiday tomorrow!” <– This works. “Your” indicates possession: it’s in the same family as “my”, “his”, “her”, “its”, “our” and “their” (which are all known as possessive adjectives). If you’re using “your” and not sure if it’s correct, swap it in for one of the other possessive adjectives and see if it still makes grammatical sense. “This is your time to shine.” Swap to: “This is my time to shine.” <– This works. Ah, the dreaded comma splice. A comma splice is the attempt to join two entirely separate parts of the sentence (which could easily be two sentences in their own right) with nothing but a comma. Both parts of that sentence could be sentences on their own (“We plan to grow our business by 50% over the next two years” and “After that we’ll consolidate and concentrate on profitability”). When you bash them together and shove a comma in between, that’s a comma splice. It’s lazy writing, basically: the writer can’t figure out how to connect the two parts of the sentence, so just inserts a comma there and hopes for the best. The thing to bear in mind is that commas are good at holding small things together – like single words. When you have two parts of a sentence that could be sentences in their own right (known as “independent clauses”), they need more than a comma to hold them together. Think of a comma as bad-quality duct tape. 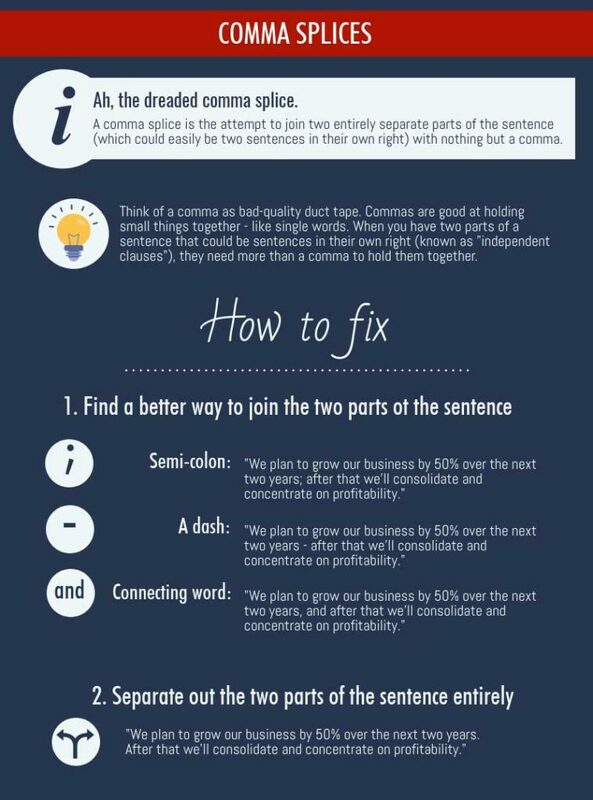 Want advice on other common writing errors? Let us know what other words/phrases confuse you, and we’ll include them in another post soon! Previous Previous post: Common Writing Errors: Can You Bear to Bare Your Mistakes?